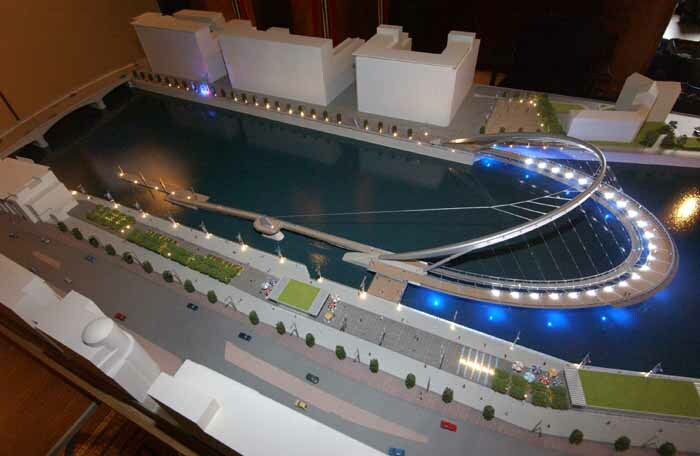 Richard Rogers Architects / WS Atkins were selected to design the new bridge across the River Clyde. £40m pedestrian curved crossing was decided by Glasgow City Council (GCC). ‘The bridge, an elliptical crescent, was the unanimous choice of the judging panel and was also the public’s favourite when it was recently displayed with models of the rival bridge designs’. 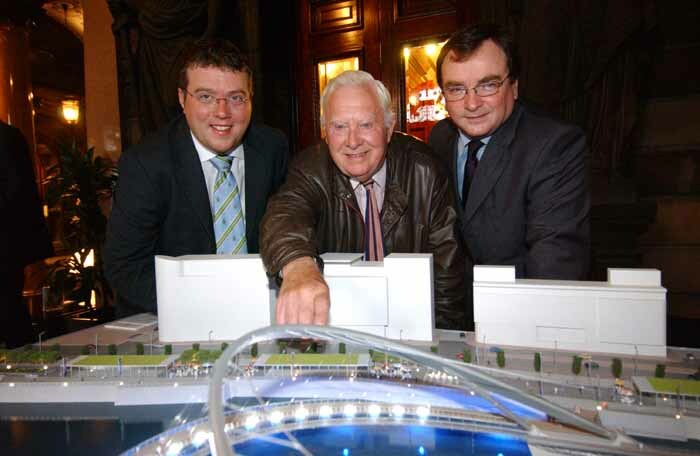 Richard Rogers / WS Atkins project to build a £18m footbridge from the Broomielaw to Tradeston: GCC were to set appoint Faithful and Gould as the bridge’s engineer designers in mid 2004. Councillor Steven Purcell, Leader of Glasgow City Council, and schoolchildren from Hillhead Primary today jointly launched a competition to name the newest pedestrian bridge over the River Clyde. The bridge which is due to start in January 2006 and finish the end of 2007 is part of a £34.6m project, of which nearly £4.7m is from the European Regional Development Fund. The Glasgow bridge project also includes a public pontoon, a new quay wall at Tradeston, the redevelopment of the public realm along both sides of the river bank with soft landscaping, pavilions to house cafes and restaurants, event spaces and innovative lighting. Turning the bridge and all other elements of the project into reality will be the job of a professional consortium led by project and cost managers Faithful & Gould, world-leading design and engineering consultancy Atkins, with renowned architects Richard Rogers Partnership and international lighting architects Speirs & Major Associates. The bridge model is owned by Atkins, who have lent it to the Council for the duration of the competition at the Museum of Transport. The Glasgow Museum of Transport is due to be relocated to a new riverside location in the next few years. Called the Riverside Museum, it will be sited on the northbank of the Clyde adjacent to the River Kelvin. The £50m Riverside Museum, designed by Zaha Hadid, is expected to open to the public in early 2009. Construction of the winning design is due to begin in August 2005. Called Neptune’s Way, the new arc-shaped bridge design uses the principle of a cable stayed compression arch and a suspended deck to create a curved ramped deck which sweeps across the river in an elliptical path. 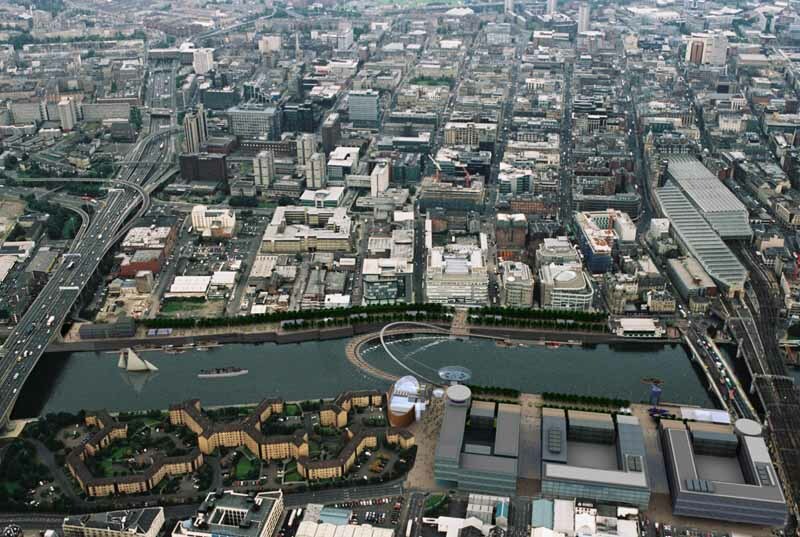 The Glasgow bridge will link Tradeston and Broomielaw, and will include high quality public realm areas on either side of the river. Glasgow City Council, which chose the design after a series of public exhibitions of the six anonymous competing designs, hopes the £40m Richard Rogers / Atkins bridge will act as a catalyst for the regeneration of Tradeston and will complement Glasgow’s flagship International Financial Services District. Faithful & Gould will provide project and cost management services. Atkins will provide engineering, landscaping, hydrology and architectural support and Richard Rogers will provide concept architecture. Lighting design will be provided by Speirs & Major. 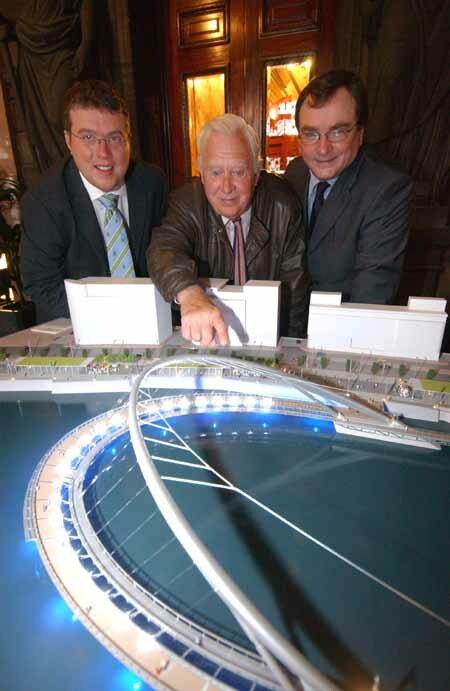 Councillor Steven Purcell, Leader of Glasgow City Council, will (August 18, 2005) unveil a giant model that brings to life a new pedestrian and cycle bridge over the River Clyde. The highly detailed model will be placed on public display in the entrance hall of Glasgow City Chambers from Thursday 18 August, 2005 until Friday 2 September, 2005. It will give the people of Glasgow a chance to see for themselves the key design elements of the structure, which looks like the bow of a boat sailing down the River Clyde between Tradeston and Broomielaw. The oval shaped bridge is part of a £34.6 million project, of which nearly £4.7 million is from the European Regional Development Fund. The project also includes a public pontoon, a new quay wall at Tradeston, the redevelopment of the public realm along both sides of the river bank with soft landscaping, pavilions to house cafes and restaurants, event spaces and innovative lighting. Councillor Purcell said: “This model will allow the people of Glasgow to see for themselves how this iconic structure will look in situ when it is completed in 2007. The bridge is a very exciting Council project that will link two of the key River Clyde regeneration projects, which are providing new homes and jobs for Glaswegians along the waterfront – the International Financial Services District on the Broomielaw and the developing urban quarter of Tradeston. Turning the bridge and all other elements of the project into reality will be the job of a professional consortium led by project and cost managers Faithful & Gould, world-leading design and engineering consultancy Atkins, with renowned architects Richard Rogers Partnership and international lighting architects Speirs & Major Associates. Construction is due to start in early 2006 and finish in late 2007. Drew Page, Director, Atkins, said: “Creating visually spectacular structures and being part of important regeneration projects is always exciting. Our experience in cities like London and Manchester demonstrate that bridges lie at the heart of riverside regeneration because of the affect they have on the way people move about the city. Guest of Honour at the Glasgow Bridge photocall will be Henry Mulholland, 82, of Tradeston. He will be joined by Councillor Purcell and Councillor Charlie Gordon, the Council’s spokesperson on the Clyde. Mr Mulholland was the first Glaswegian to view the six finalists in the competition to design the new pedestrian bridge over the Clyde. The public exhibition of the finalists was held at The Lighthouse, Glasgow between 22 Dec 2003 and 28 Jan 2004.